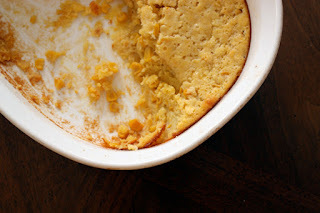 The Best Ever Corn Pudding - You might need to make it today! This recipe is to be posted ASAP for my friend Susan who needs it for this weekend. May I suggest you need it too? Corn pudding is a classic dish on the tables of so many American families at Thanksgiving (in November there) and that is just where I was introduced to it, at the table of my Momma Franks, a Thanksgiving Feast expert! It is basically a super delicious and extra rich cornbread with every good thing in it and all you gotta do is stir, pour and bake. Then sit back and take all the credit! Thanksgiving is no time for restraint! 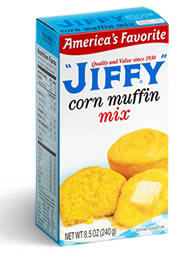 You are to add one box Jiffy Corn Muffin Online Store Mix but we can't usually get it here so the recipe at the bottom is my own version and it comes out great. Or just substitute another corn muffin mix and measure what you need. 1. Preheat oven to 350'F. Grease a baking dish of your choosing, I like a classic smaller corningware dish or high sided crock. Set aside. Note: If you use a shallow baking dish it might take 10-15 minutes less to bake. 2. In a mixing bowl combine all the ingredients and stir until all the dry is incorporated and everything looks consistent. Pour into prepped dish. 3. Bake uncovered for 45 min's or until light golden on top with a slight jiggle in middle when you bump it. It should seem set but not firm. 4. Let stand at least 10 minutes before serving. Or, chill and reheat for your occasion. Can be made up to 2 days ahead. 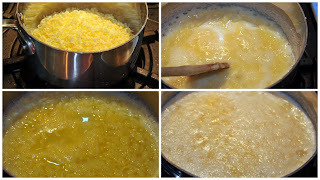 Use 1 Cup per recipe Corn Pudding. This recipe makes enough for several corn puddings, wink wink. 1. Mix all together and store in a cool dry place for many months. Two things are on my mind today and as usual one is related to parenting and one to food, shocking I know! Anyone who knows me well can tell you that I am opinionated. It's not that I have to share my opinion, it's just that if you ask me what I think about any given subject, it is likely I will have thoughts to share. Fortunately for me, my husband, family and friends appreciate this in me and often ask me for my thoughts. As an optimist and an extravert, I feel honoured to be given an outlet for my thoughts and feelings amongst those I love. Guess what? That means you too my sweet blog readers! If you came to visit this place then you have likely already realized I have a lot to say and I thank you for reading and also for returning! First let's talk parenting. 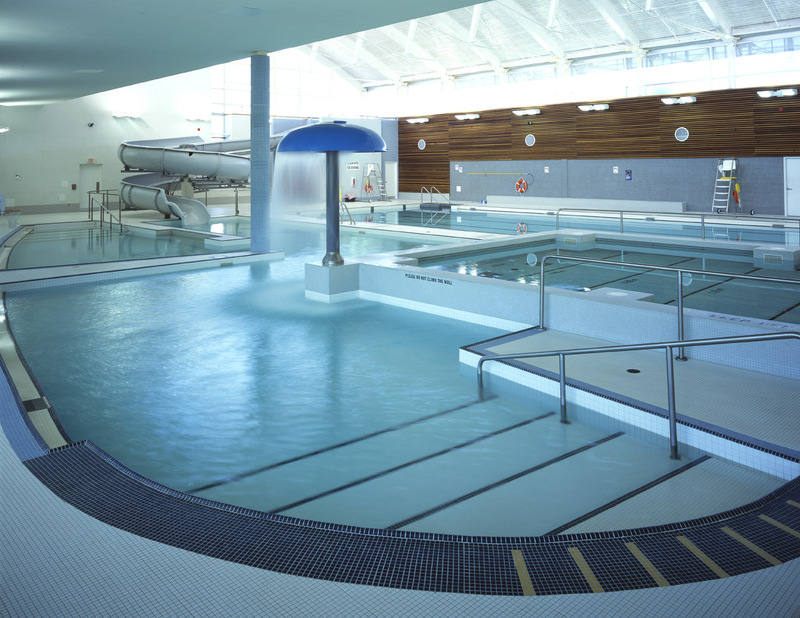 Today was Tricia's first swim lesson. She is passed out cold at present after givinh her time in the pool her all, like really her ALL. She didn't appreciate my suggestions to follow the instructions for floating and she didn't care for the fact that she couldn't touch the bottom and so needed me for support throughout most of the class. What she really wanted was to figure it out herself and go down the slide 900 times. We had a couple of chats on the side about listening etc but those didn't change the fact that she LOVES to be in the water and I was in the way of total freedom. I am happy she is brave in the water. I am happy she is taking lessons and I am happy that we are both learning and growing everyday. Her lesson today was different than mine, in fact I don't know if there was a lesson for her. She just knows she wants to do that again. The lesson for me is simple, it is: Let Tricia be Tricia. I cannot demand she be meek or mild. I cannot demand she learn differently than she does (can you say experiential learner?) and I cannot be upset or embarrassed that my baby is not afraid of new things like her momma. I was the most timid child ever and couldn't bare to be in a new situation without the support of someone I trusted. Tricia on the other hand would happily come find me if and when she needs me. I have actually prayed and asked God to give me children who don't learn to be afraid from me. I don't want them to struggle through life missing out on good things because they can't overcome their fear of change or newness or different. I want them to be bold, fearless and full of love and excitement for life. I guess God knew He should start me off in the right direction with Tricia. His ways are marvelous! The second thing I have been thinking about is coffee. Coffee is a big deal to me. Some of you may already know that I have been serving coffee (good coffee) for 11 years and I love it! The smell, the taste, the social moments shared between friends (kudos to all hot drinks), these are the foundations for my love of the stuff. Now, while I consider purchasing locally produced products an important thing for us consumers, sadly I must inform you that coffee will never grow in Canada. Due to this unfortunate reality buying coffee can present any number of dilemmas. 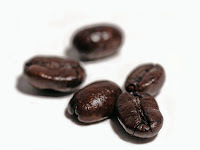 Type of bean, roast, location of plantation, price, packaging, organic and trade certifications. These are all components of coffee that can have a significant impact on what ends up in your cup. I am not a food snob, but I have to confess to you that I bought cheap ground coffee this past week and have been regretting it more seriously than you might believe. Not only does it taste like burnt cigarettes but it lacks depth, cost me nothing, and I know nothing about where it came from, what's in it (type of bean and origin) or who grew it. I feel sad for them wherever they are, I hope they don't drink it themselves. The reality is that I truly and firmly believe in Fairly Traded Organic coffee (See this link for the Wikipedia low down). I also love the idea of single plantation but am not tied to that one. Already some of you are rolling your eyes and mumbling "hippy" to yourselves and that is fine by me. It is likely because you don't have all the facts. The reason fair trade is important is for the same reason that farmers markets are important. It is so that you can connect to your grower in a unique and wonderful way. It is so that you can walk away from your purchase with the knowledge that you are helping to sustain the livelihoods of folks who love what they do and want to continue to do it well. The amazing thing is that it tastes better too. Whether it is a woman's cooperative or a family run estate, Fair Trade certification makes field to cup possible on an intimate level that ensures the folks growing those beans care how they turn out, how they are stored and where they go. They want your cup of coffee to be good so that you will want to buy their coffee again. Do you pay a little more? Yup. Is it worth every penny? You'd better believe it! If you aren't convinced come to my house for a tasting. I will convert you in moments and then we can have a great chat over a cup of Joe. I won't talk organic now but you'll be hard pressed to find a Fair Trade grower who doesn't also grow organically, so there. Now for a recipe. I love hot coffee and I love iced coffee, I just hate lukewarm coffee. The following instructions are for making your hot coffee and then using the leftovers for iced coffee. No wasting when the coffee is good and you paid a fair price for it, right? I use a drip percolator or filter cone into a thermos, but if you prefer a Bodum you just need to buy whole beans so you can grind them less finely than most pre-ground products. Note: I also always pre-heat my cup with a little hot water and I use a wooden or plastic spoon to stir so I don't lose heat into a metal spoon. 1. Make a simple sugar syrup by placing 1 1/2 cups water and 1/2 cup sugar in a small pot and bringing to a boil. Stir once and cool. Keep in fridge for up to a month. 2. Brew your hot coffee and enjoy a cup with a friend or with a book, or at your desk. 3. Within 1/2 an hour of brewing your coffee, turn it off and let it cool. Place in the fridge as soon as possible. 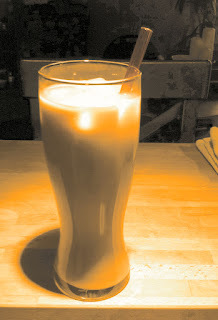 Once it is nice and cold and you are ready for a different kind of caffinated beverage combine the milk, cream, coffee and sugar syrup with the cold coffee. 4. Place ice in a large cup and pour coffee mixture over ice, let sit 1 minute so it can get nice and cold. I recommend mixing the coffee separate from the ice so it doesn't need stirring. Enjoy! Daddy takes T for an adventure!! Laundry is such common ground for all of us. Whether you're hanging it on the line outside your window in a Greek village, scrubbing hard in a river in Africa or using your state of the art energy efficient front loader to getter done, we all work hard to restore our clothing after life takes its toll. My sister Bethany shared a recipe with me about a year ago for making my own all natural but effective laundry soap and I think it is one of those things that just has to be shared. Not only is it free of dyes, perfumes and chemical additives, it does a great job of the wash, smells lovely and is basically free to make. That's it! That's all you need and you will get many many batches of this soap from the Borax and Washing Soda so consider these items an investment. Note: For a personal touch, add 6 drops of your favourite essential oil just prior to blitzing with the immersion blender, smells uh-mazing!! My fav is lavender. 1. Coarsely grate 1/2 bar of laundry soap. 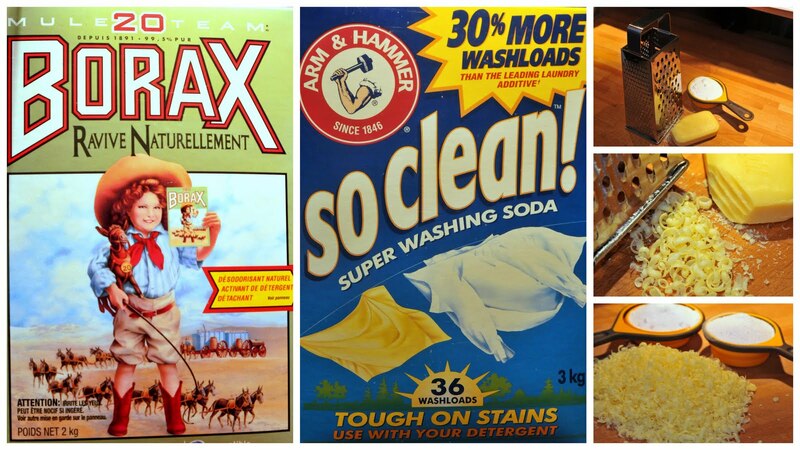 Measure out 1/2 cup each Borax and Washing Soda, set aside. 2. In a meium saucepan combine grated laundry bar with 2 cups water. 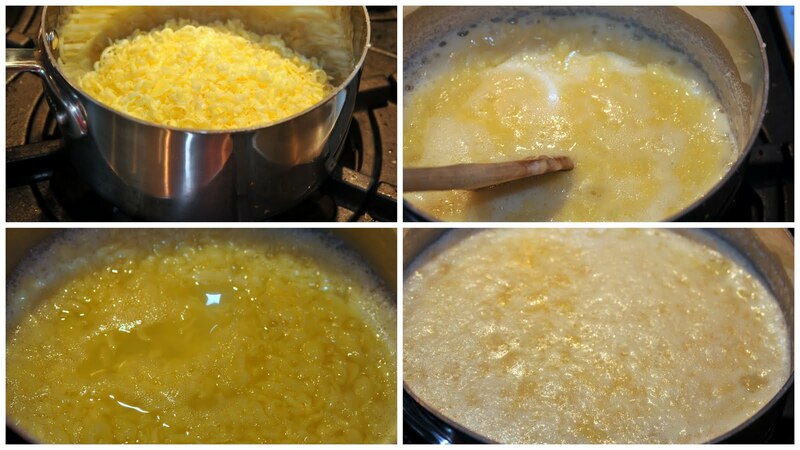 Bring to a boil, reduce heat and simmer, stirring occassionally until almost all the soap is melted. Add remaining ingredients plus 2 more cups water and cook, sitrring often for 2 minutes or until bubbly well mixed. 3. 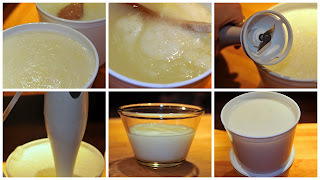 Pour cooked soap mix into another 12 cups cool water, stir with a spoon to mix and then set aside for a couple of hours or until cooled to room temp. You will find the mixture separates into a thick layer on top and a watery layer on the bottom. 4. Now puree the whole mixture until it is a smooth white gel, be sure you find all the lumps for evenness. The laundry soap is now ready to be divided into containers of your choosing. Use the soap for spot treating ahead of washing or just add 2 Tbsp (1/2 a lid full on most high efficiency liquid detergents). Of course you can add more or less depending on the size and dirt factor of the load. I always like to include a few tidbits about what has been happening in our household of late since Tricia is always up to her little ways and as she grows so does her capacity for mischief! Breaking an Entering - Tricia is always veering off the path, but the other day off the path didn't seem adventuresome enough for this girl. So she quickly and efficiently (before I could catch up) made her way up a driveway in our neighbourhood, entered their side screen door and wandered into their kitchen to check things out. I felt embarrassed as I announced my own presence and tried to verbally warn these strangers of the trespasser, sheesh! Petty Theft - Toddlers are always collecting treasure and everyday Tricia tells me that pretty much everything in my house, at the store and in the world is hers, or "Mine!" as she so deftly puts it. Well, with this belief firmly in her mind she took a pair of keys the other night, put them in her purse and there they stayed until after she got home, had daddy put her to bed and then heard him sneak back in to her room to check her purse for them. Mommy was stranded without them and had been searching at their friends house for a good 1/2 an hour! Falling in Love... with Football! - Always in search of something new, Tricia recently discovered the fun of watching football as a family. Much to her mom and dad's delight I might add. We love our Redskins, we make special snacks and we have fun snuggling on the couch with her. Now she just needs a jersey to wear so the whole family matches on game day. Shoe Fetish - "My shoes!!" are literally the first words out of T's mouth every morning, and if she can't find the pair she has her heart set on then watch out cause you will be looking for them until they are found and she has them firmly in place. That is of course until she sees another pair she would rather wear and it all begins again.... what's wrong with being barefoot? Oh yeah, and she refuses to wear socks. Public Displays - "Cause baby you're a firework" is the new tune of choice as Tricia discovered this song is not only great for dancing to, but also singing over and over and over. She even added her own lyrics "Doggy, doggy, doggies, dog!". In other public moments we have been making friends with everyone we meet. We say "hi", "bye", "friend" and then we tell them something interesting about ourselves, our mommy, our doggy or our babies at home. I of course translate and folks sweetly give us their attention and interest. It's amazing to watch people I would avoid, melt on the spot, it is good for me to be reminded how approachable people really are when their guard can be lowered for a moment. We start swimming lessons this week, I'm working hard on prototypes for my business (you have to have inventory to sell inventory, hah) and we're gearing up for my friends wedding. Tricia is the flower girl and I can't wait but I'll confess I am also nervous about what she might come up with... like taking off her clothes in the middle of the isle?? This month we also get to have a shower at our house, Cowgirl themed and all!! Thank you all for voting on the recipe poll, it is very helpful and will totally influence the recipes I post. I hope you like this soap one, let me know if you have any questions or need more information as usual and I will respond promptly. In the meantime, enjoy fresh smelling clean clothes! !